The design is my own, for the Xs and Os in a playbook. Also, hugs and kisses - but don't tell my husband that. 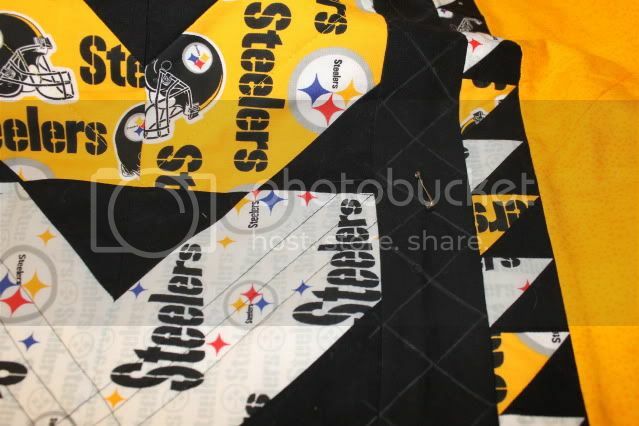 The yellow is The Name Game by Quilt Country (Moda), the black is Kona, and the Steelers fabric is...Steelers fabric. 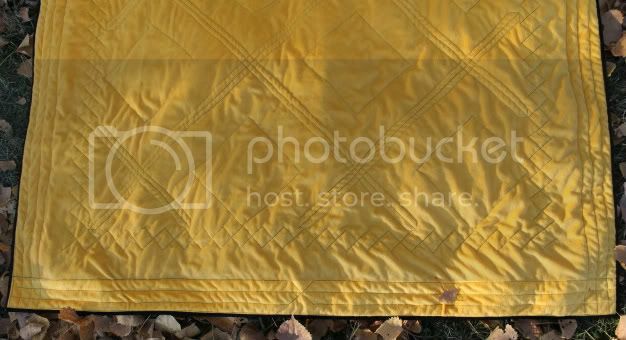 It's backed in yellow minkee, and you can see a bit of the quilting. 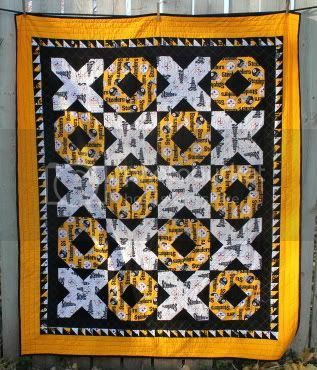 I outlined the Os, did three parallel lines through the Xs, cross-hatched the black border and did three straight lines with a cross in the yellow border. 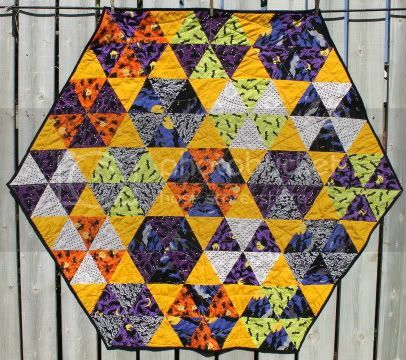 Some of the quilting from the front. 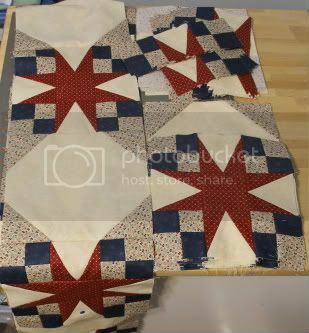 All of the little HSTs in the second border are leftover double-stitched from the blocks. 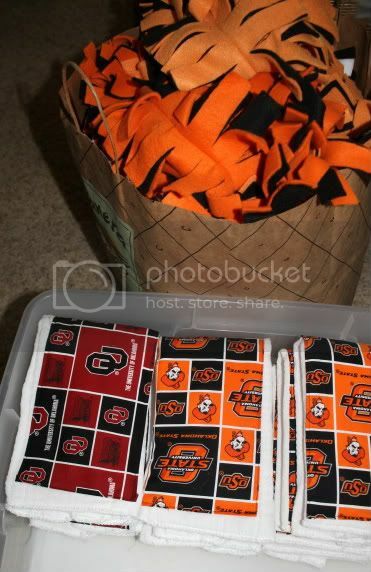 I still have a little pile of them to make a matching throw pillow. Lucky, lucky me. My husband is hoping it will get a lot of use in playoff season. 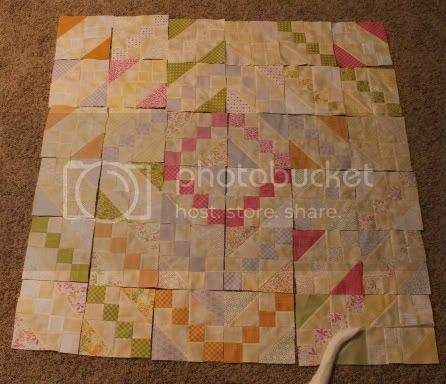 I missed making Swoon blocks. And I love how the corners in this one swirl. Tried something new for this one - pressing the seams open. It's a very bulky block, especially in the 8" size. I found that my points weren't as neat, but it lays much flatter. I think in the future, I'll do a mix of open and nested seams. 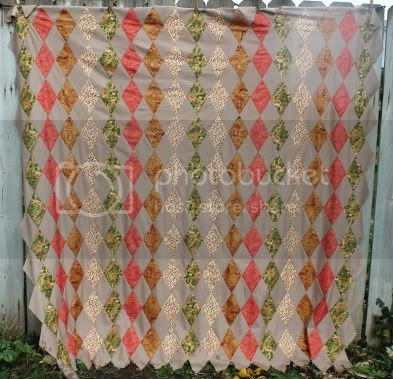 The back is prettier, though. Oh, and don't you just hate when you find out someone else is doing your "thing"? 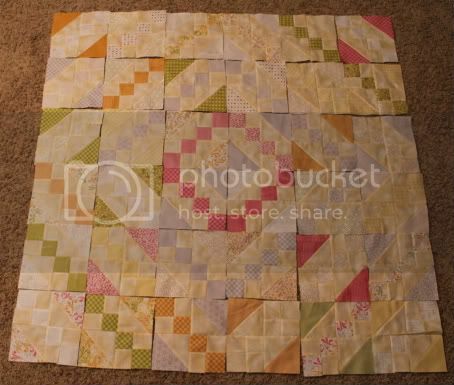 Cupcakes 'n' Daisies made a 6.75" Swoon block. And I thought 8" was small! 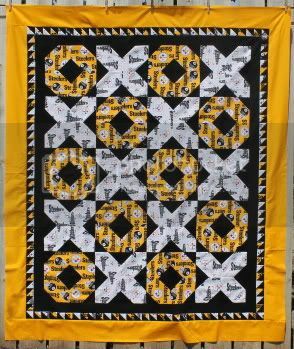 Finished quilting the Steelers Quilt, but it's too cloudy and windy outside for glamour shots. So have a sneak peek for now. 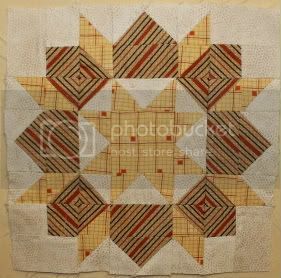 Hunter's Star, round two - 84/90 light blue half-blocks - halfway home stretch! 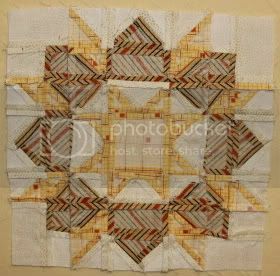 The next strip will be half light and half dark! I really don't know how you people with jobs do this. I've been running around like mad organizing fundraisers and venues for our squadron's holiday party, and when I get home, I don't have the energy to do a Swoon block. 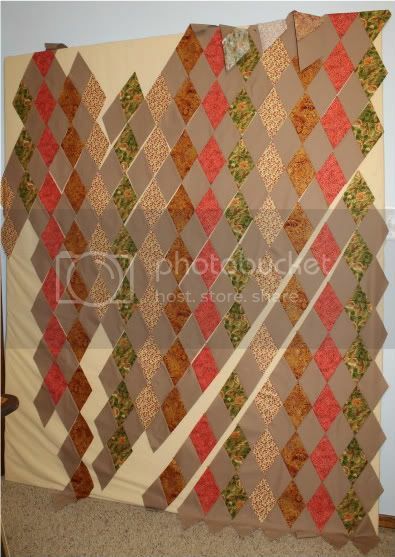 I started piecing my Fall-gyle top instead - because offset seams and bias edges are so much easier than a Swoon block. Only 3/4ths of it fit on my design wall. 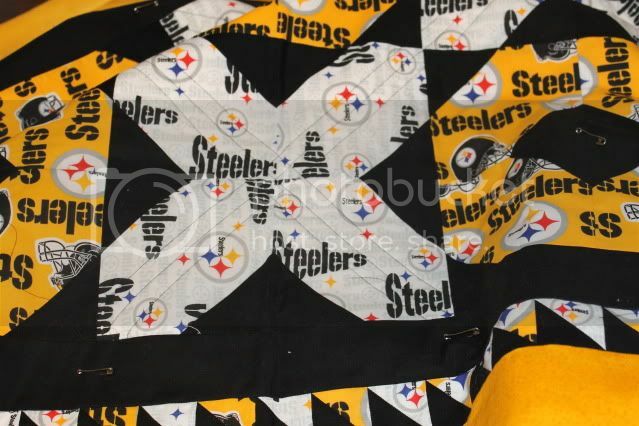 I'm also quilting the Steelers Quilt. 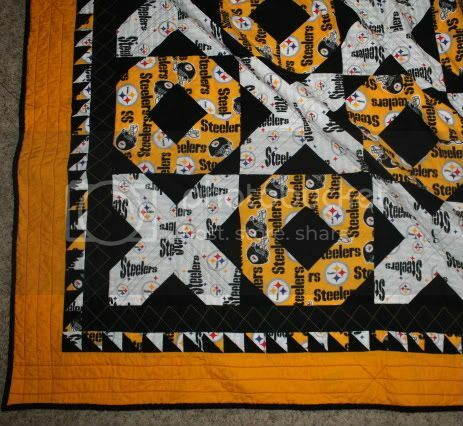 This is my first "custom" quilting. I did three outlining lines in black on the Xs, and I'm switching to gold thread in the Os - unfortunately, this means a lot of knots to bury since the Os don't touch! 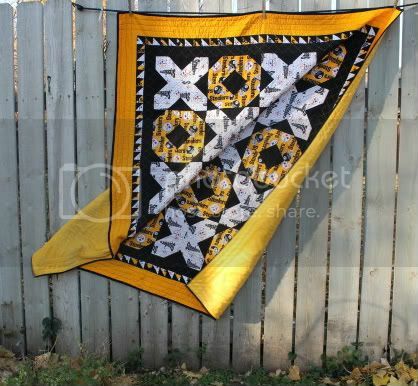 Each border will get Xed and Oed in contrasting thread, as well. I got it done before Halloween, even. 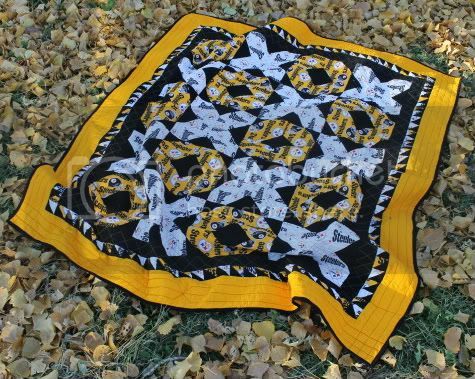 Quiltville Orca Bay - I know, I have way too many projects, and Bonnie's quilts have an insane amount of piecing, and I'm far too controlling to do a "mystery" quilt... But I think I'm going to anyway. Starts 11/18.